Everything--not only the crow but the white paint, the two lines through each eye, and the feathers--suggests this was the costume's source. The only other possibility is that both Depp's Tonto and Sattler's Crow had an earlier source. But no one who researched the question has found such a source. So what's the problem? Sattler is a white artist who romanticizes Indians. Here's his artistic statement:"I have always had an interest in indigenous cultures, their costumes and their relationship with nature. Growing up in the west offered countless museum collections and access to libraries filled with artifacts and research materials. It was natural for me to study the Plains Indians. The writings of Joseph Campbell continue as a major influence for my work." Sattler’s portraits have evolved over the 30 years of perfecting the technique. He is not mainly concerned with being historically accurate. His art interpretations give a feeling of authenticity without being specific to a particular tribe.So Sattler isn't concerned with accuracy. His paintings aren't specific to a particular tribe. If they were, it would be the Plains tribes he studied, not the Comanche or Apache of Texas. Is there any excuse for using this painting as a source? Maybe, if someone could answer the following questions: 1) Is the painting based on something real? 2) What tribe or culture is it from? 3) What does the regalia mean? 4) How common is it? I don't know the answers, but Sattler's statement suggests his paintings aren't based on anything but his own fantasies. Some people were sure Johnny Depp would research his character and do him right. Apparently not. With all the resources available, this is the best he could come up with? Cowboys of the Caribbean or Pirates of the Plains...you decide. Someone attached Sattler's painting to the story because of the "crow's head" thing. I suspect the story came first and the painting a distant second. I'd be surprised if Sattler even knew of it. The key line may be this:Crow-head was a dwarf. 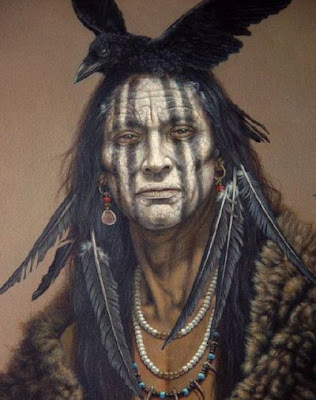 He went to the river with the crow-skin on his back and a blanket over it, pretending to mourn his lost relatives.That sure doesn't sound like the guy in the painting. The story makes it clear Crow-Head wears a crow-skin on his back, not a crow on his head. And the Chipewyan live in Manitoba, Saskatchewan, and Alberta, not the southern plains. I'm not seeing anything indicating that Texas Indians dressed like this. They have a variety of looks, but nothing wild or extravagant. Only a few even wear the standard Plains headdress. These are not people who go around with crows on their heads. "A Crow Indian Wearing a Hawk Head Dress"
The source notes:Here for your enjoyment is an absorbing photograph of Two Whistles, a Crow man. It was made in 1908 by Edward S. Curtis. 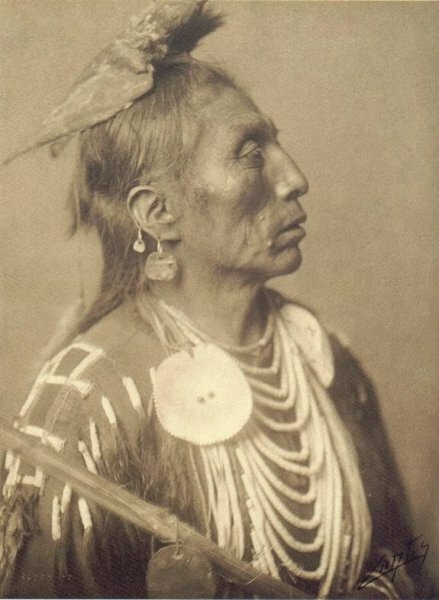 The photo illustrates this Crow (Apsaroke) man, in a head-and-shoulders portrait, right profile. He has his face covered with war paint, and is wearing a medicine hawk headdress, a buckskin shirt, and a shell necklaces. The caption reads: "Medicine Crow--Aparaoke--circa 1908." Perhaps these were the ultimate sources for Sattler's painting and Depp's costume. But note the key differences. The birds are lifeless, mummified. They're not posed with wings spread like the Flying Nun's habit. The one bird identified is a hawk, not a crow. These birds presumably have some meaning that's missing from Depp's interpretation. So he's falsifying their spiritual beliefs based on...nothing. He's inventing mystical mumbo-jumbo and passing it off as real. And note that these are only two of tens of thousands of old photos. The bird headdress is obviously extremely rare, but Depp is presenting it as if it's commonplace. He's creating an image of Natives at odds with the reality. It's the flip side of putting a movie Indian in a Plains headdress. That headdress is too common; this one is too rare. Can't Depp give us an Indian who looks like the vast majority of 19th-century Indians--i.e., without an attention-getting headdress? Also, the men aren't wearing garish warpaint like Depp's. That clearly comes from Sattler's painting. And finally, the men are Crow Indians, not Comanche or Apache. They lived in the Dakota region, not in Texas, a thousand miles away. They have nothing in common with Depp's Tonto except being Indians with birds on their heads. So Depp took a fictional Indian from a painting...possibly based on real Indians from an entirely different culture...and transplanted him to Texas. The birds are described as medicine birds, which means they have spiritual significance to the tribes they come from. Will Depp explain all that when he appears on screen? Or will he be a generic "spooky" Indian with no explanation? "As for what tribe or culture he comes from, who cares? Viewers won't know the difference. We're giving them a wacky look they haven't seen before. I'm Cherokee, Tonto is Comanche, and Crow-Head is Chipewyan--that's close enough for a movie. "They all have the 'ch' sound, which is also in 'ka-ching!' Which is the sound of the money I hope to make by exploiting Indians. If people get the wrong idea about them...again, who cares?" I'm pretty sure all Depp said was 'Where is my money' as he got paid to play a part in a movie. I'm pretty sure he didn't write the movie or do anything more than what he is paid to do which is act. Shouldn't this angst be directed to the writers, producers, directors, movie studio heads, etc. who actually plan, finance, and make the lions share of profit off this movie or does it feel better to go after the least important though most noticeable person in the creation of this? I'm pretty sure The Lone Ranger wouldn't have happened without Depp. He's a movie star, not merely an actor. He doesn't need to write the script himself. Someone with his clout can have writers and directors hired or fired if they don't mollify him. Depp wanted to pay homage to his Native roots. I believe he dreamed up his own take on Tonto and had a script written to match it. We know the costume was his idea; I'm guessing he contributed heavily to Tonto's character and back story. I often write "Depp and company" to criticize everyone involved. But no way is Depp the least important person. The three creative forces are Depp, Jerry Bruckheimer, and Gore Verbinski, and I'd list them in that order of importance.